I guarantee that you will have no left-overs. No matter how many I make, it is never enough! Peel onions down far enough to remove all the tough, thin, outer layers. You will need just the largest slices. Reserve the rest for another purpose. Cut onions in half around the equator. Cut 2 slices, each 1/2-inch wide, from each half so you have 4 center slices from each onion. Push out the centers from the slices leaving the 4 outermost rings in place. Separate them into into 2 rings that are each 2 layers thick, Be careful to keep the 2 layers of each slice intact. You should now have 8 onion rings from each onion for a total of 16 double-layered rings. 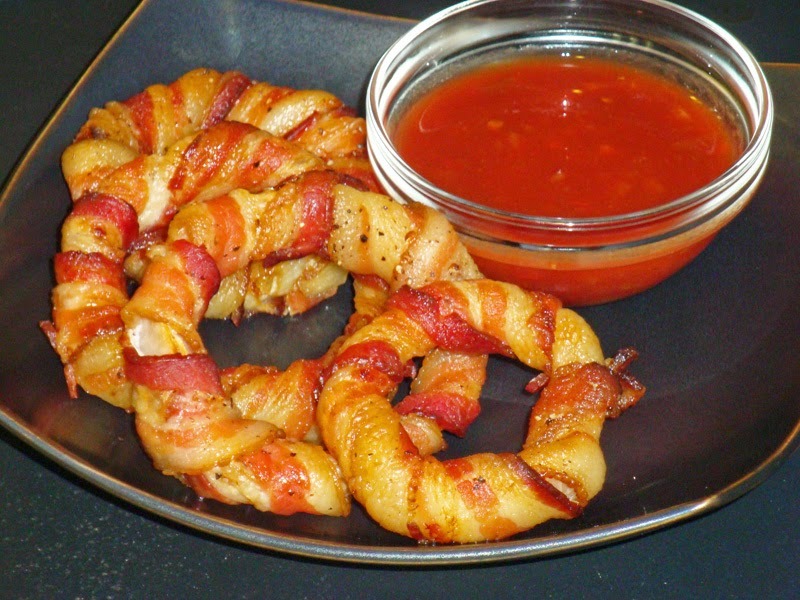 Wrap each of the 16 rings with raw bacon. It will take about a slice and a half for each one, more or less, depending on the size. Overlap the bacon slices slightly as you wrap and tuck the ends under to secure. You may use wooden picks or skewers if it makes it easier, but the bacon tends to stick to its self so you may not need them. The bacon will tighten and shrink as it cooks and that helps hold it together too. Refrigerate until ready to cook. Serve as an appetizer or snack with low-carb barbecue sauce, ketchup, ranch dressing, Dijon mustard, or Siracha hot sauce for dipping. Recipe adapted from one by John Thomas on his BBQ blog at www.grilling24x7.com. Thank you, John! Makes 8 serving of 2 onion rings each. ~Using single- rather than double-layered onion rings will cut the carbs in half, but they will be a little more fragile. ~The onion rings can be deep fried at 325 degrees F until crisp rather than oven baked. “Nourished; a Cookbook for Health, Weight Loss, and Metabolic Balance” is available in print or Kindle with a $2.99 Matchbook offer > http://tinyurl.com/mq42koa. Wowzers, Judy!! This is an AWESOME idea! Is there a print button somewhere that I am missing? littlered, no I don't have a print button. I'm not very techie and would have to hire someone to redesign my site to add one. You can copy the text and paste it onto another page and print that, I think. 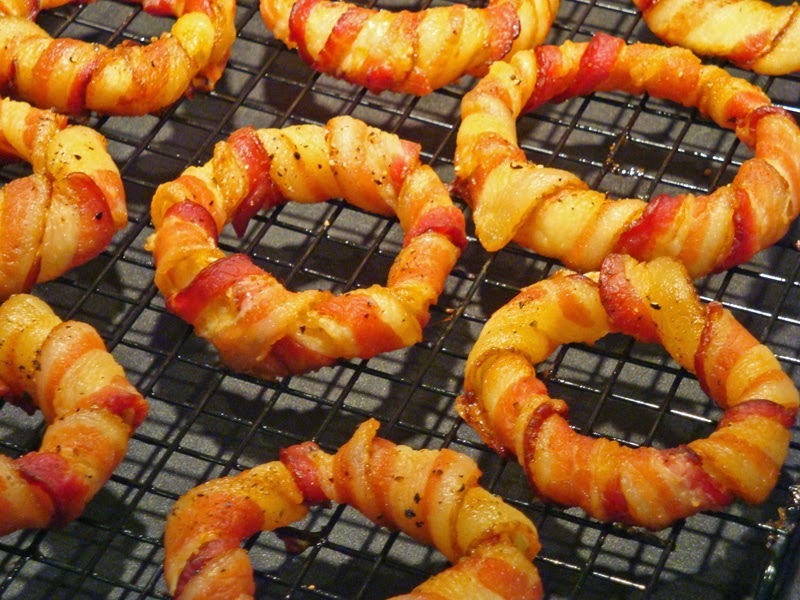 Crispy and very attractive onion rings, prefect for rainy evening snacks. Glad you liked them, Rachel Page! Hmm, think I need to go make some–now!